You're probably asking yourself: Why buy headphones? 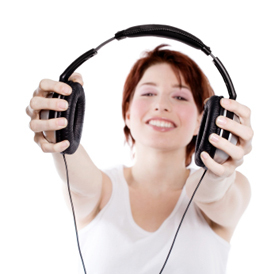 Don't headphones come free with music players and music-enabled cell phones? Yes and no. With free headphones—earbud, clip-on, behind-the-neck so-called "street" style headphones and traditional over-the-head headphones—you get what you pay for: headphones that usually are cheaply made, provide poor sound and, most importantly, are poor-fitting and not very stylish. Even the ubiquitous white "stick" headphones that come with Apple's iPod and iPhone often hang loosely from your ears and need frequent readjustment to sit securely—that is until you move your head and you have to readjust them. So it's well worth spending the money for even a modestly-priced set of headphones—certainly less than $100—to get a dramatically improved listening experience and, more importantly, a more secure, comfortable fit. Do You Have to Spend a lot to Get Good Headphones? Do you have to spend a lot to get a good set of headphones? No, no no! Once you get above $100, only those with truly golden ears will notice a difference. As you spend more money, the biggest differentiators between models will be how much and how smooth the bass is, how solid the build quality is (over time, only the more solid models will remain in one piece as you jerk earbuds out of your ears), the number of included ear tips and how comfortable and sound isolating they are. Style: "Headphones" is actually a misnomer since in-ear (or in-canal) earbuds have become the most popular type of headphones for music listening away from home. Earbuds come in two distinct types—those with ear speakers that sit on or hover over the ear canal and allow you to hear ambient noise, and true in-ear buds with speakers that fit inside the ear canal and eliminate up to 90 percent of ambient noise. Most free earbuds sit outside the canal, one reason why many music lovers replace them with sound-isolating models. In addition to ambient noise, nearby people can hear what you're listening to, and any sound others can hear is music you aren't. In-canal earbuds keep all the music in your head and actually help preserve your hearing since, with no sound leakage, you can listen to music at lower levels and still enjoy the subtleties. Yes, you can still buy true over-the-head headphones. While these big ear cup headphones provide a more enveloping aural experience than in-your-head sounding earbuds, they are bulky and inconvenient for every day portable use. But during the winter, they serve excellent double-duty as ear muffs. Noise Cancellation: You can reduce outside noise either "passively", with in-ear or well-padded over-the-head headphones, or buy a pair of "active" noise cancellation headphones. Noise cancelling headphones cost significantly more, and may not be worth the money unless you don't like in-canal earbuds. They use sophisticated digital sound processing to reduce consistent high-pitched sounds like the engine drone in airplanes and the highway whine in buses or cars. They don't do much to eliminate noises in the middle and lower end of the frequency range, such as conversations or ambient street noise. 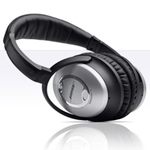 And even the best noise reducing headphones (the Bose Quiet Comfort 15) dampen only 75 percent of this travel din. Also, noise cancelling headphones have to be powered by some type of battery. Without power, noise cancelling headphones won't work at all. By contrast, a sub-$100 pair of snug-fitting in-canal earbuds will eliminate up to 90 percent of all noise at all frequencies, don't need batteries, weigh next to nothing, and can be quickly shoved into your pocket or wound around your music player for storage. Bluetooth: Even casual listeners can hear that Bluetooth stereo suffers when compared to wired listening. Most Bluetooth stereo headphones suffer from critical flaws on either the music listening side, the conversation side or in comfort and ergonomics—and sometimes, all three. Steer clear of Bluetooth unless you're pairing it with a cell phone. Microphone (for Music Cell Phone/iPhone): If you've got an iPhone or one of the increasing number of music-centric cell phones, you don't have to replace your favorite headphones with a new set that has an in-line microphone. Several companies make adapters that add an in-line mic, call and music controls to your standard stereo headphones. iPhone-compatible adapters also enable Apple's voice control features. The best of these adapters is the Shure Mobile Phone Adapter, which comes in two versions, one for both iPhones and BlackBerrys (model MPA-3C), and one for Palm Treo (model MPA-3B ). But if you're in the market for new headphones, spend the extra $10 or $20 and get a set of earbuds with an in-line mic, even if you don't use your cell phone to listen to music. Considering how rapidly the iPhone and other cell phones have developed into fully functional digital music players, and since we replace our cell phones every couple of years, you may not use the in-line mic today, but next year may be a different story. At this price, you can find comfortable and stylish headphones, but don't expect them to last a lifetime. You'll also find a lot of headphones offering more style than sound, and fewer earbuds with additional interchangeable ear tips. Check to see what comes in the package. 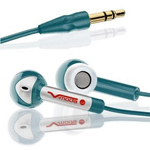 JVC Marshmallow (street: $12, retail $20) Arguably the best-sounding headphones for the money. 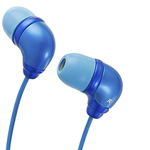 These critically-acclaimed affordable earbuds are known for their style and come in nine colors, designed to match the fourth generation Apple iPod Nano and Shuffle. Like more expensive earbuds, the included (and aptly-named) Marshmallow ear tips are made from spongy memory foam to seal your ear canal and leave you alone with your music. V-Moda Bass Freq (street: $21, retail $30) These earbuds pump out the most bass for the price, perfect for keeping in rhythm while you're working out or dancing with yourself. They also come in nine different colors—not only the ear pieces but the cords as well. You also get three different-sized silicon ear tips. Afraid of ordering them without trying them out? The company offers a 30-day in-home audition period. Altec Lansing BackBeat Plus (street: $33, retail: $50) Yes, these earbuds from this venerable speaker maker sound good, they include an in-line mic for use with a music cell phone such as the iPhone, you get three different-sized pairs of swappable ear tips and you get a convenient cloth carry case. But the best thing about these earbuds are the cloth cable, which makes them tough to tangle and easy to untangle in case they do. In this pricing sweet spot you'll find a confluence of sweet sound and style. Expect extra foam, silicon or rubber replaceable ear tips, a cord clip and a carry case. These are mere amenities when compared to the improved sound, especially the bass response, and the better build quality, so the cords won't snap off the buds when you jerk them out of your ears. 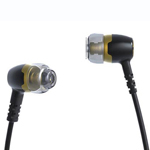 Best of all, you'll find a variety of headphones that include in-line microphones for use with iPhone and other music cell phones. Altec Lansing BackBeat Titanium 326 (street: $30, retail: $80) Thanks to titanium-enhanced speakers, these headphones reproduce a wide frequency range, so you can hear the lowest lows and the highest highs. You also get a wide selection of interchangeable ear tips—six pairs. The phones and the tips are all comfortably stored in a circular soft-sided pouch no bigger than a compact. 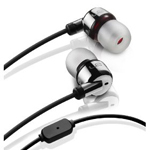 Ultimate Ears MetroFi 220vi (street: $89, retail: $100) A red ring 'round the right earpiece makes it easy to quickly identify which bud goes in which ear—something that is often needlessly difficult. Once you've placed the buds in the correct ears, you can revel in the sweet sound, including a surprisingly robust bass. To ensure a sealed noise-isolating fit, these phones include three different-sized silicone ear tips and a low-profile design so they sit flush and securely in your ears in case you want to listen while lying down. Includes an inline mic. 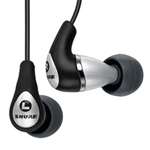 Shure SE115 (street: $68, retail: $120) The critically-acclaimed SE115's are designed to be looped over-the-ear, the bud placed in the ear and the bulky rear resting snuggly within your ear folds to ensure they won't shake loose. Not only are they comfortable, the rubbery foam ear tips form one of the tightest earbud seals possible to block out all but the loudest ambient sounds, and they offer a rich, dynamic bass. Companies that make expensive headphones care about only one thing: sound. As a result, you will hear a distinct difference between free 'phones or headphones priced less than $100 and headphones at this range. Besides more sophisticated speaker drivers and audio technology, you'll get interchangeable ear tips built from better materials to completely isolate you from your environment. The first improvement you'll notice is much more sensual, natural bass, a difficult chore for most low-end in-ear headphones. You'll also hear better stereo separation and wider frequency response, which translates into you hearing more of the subtleties in your music. One major drawback to high-priced headphones: you'll hear everything that's wrong with your digitally-compressed music—all of a sudden, tracks will sound flat and lifeless compared to their original CD versions. You'll be tempted to re-rip your entire CD collection at a higher bit rate, or even uncompressed, so you can hear everything you've been missing listening to compressed music through those lousy free headphones. On a more positive note (pun intended), full sound isolation means you can listen to music at lower, safer volumes and still hear all your music's finer points. Etymotic HF5 (street: $120, retail: $150) Shockingly light, these critically-acclaimed earbuds have a wide dynamic range that lets you hear more of your music. You get interchangeable silicon noise-isolating ear tips as well as ear tips made of sponge-like foam, which allow in some ambient noise. One drawback: the earpieces stick out perpendicularly from your ear. 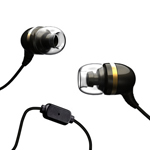 Etymotic's HF2 ($126, usually $180 ) are the same exact earphones with an in-line mic and iPhone's Voice Control and music navigation. 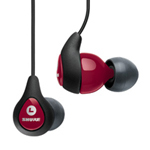 Shure SE310 (street: $160, retail: $250) These earphones represent the middle of Shure's line, a sweet spot in price and higher-end performance, feature the company's Tuned BassPort technology, for improved bass response, and come with an assortment of ear tips. Shures are designed to be worn with the earbud cords looped over your ear and the rear resting within your ear folds, offering arguably the best and most secure fit of any isolating earbud, save the Ultimate Ear Custom models. Ultimate Ear Custom UE 4 Pro (street/retail: $399) Aptly named, these are truly custom-made personal monitors, the kind you see musicians wear on stage. You go to an Ultimate Ears authorized audiologist and have silicon shot into your ears to have a mold made (a painless procedure that costs an additional $50). A couple of weeks later, your custom earbuds arrive in a personalized metal case. 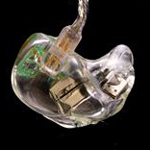 Molded to meld into your ears, these clear ear speakers are nearly invisible. 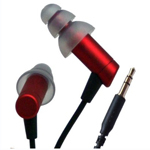 Best of all, they provide a perfect sound-isolating seal, and pump, well, ultimate sound into your ears. For an additional $50, you can have an "ambience" feature built in, which lets in outside noise. These custom earphones do take a bit of getting used to, but eventually they become second nature. You want comfort and something that looks like a fashion accessory. Audio-Technica ATH-ON3W (street: $31, retail: $70) Your hair can hide the thin over-the-head adjustable wire headband on these almost dainty headphones. 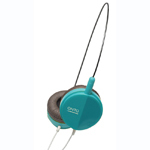 Only the surprisingly light, cushioned and fashionably-hued ear pads are visible. 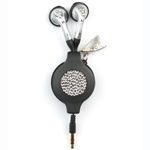 For portability and storage, the earpieces swivel to fold flat. Audio-Technica is a well-respected audio company whose first interest is sound, and these headphones deliver while letting you hear what's going on around you. chicBuds (street: $31, retail: $40) Now you can get earbuds that are both girly and practical—chicBuds are designed to be tangle-free. The cords retract into a wrap-around case encrusted with Swarovski Crystals, and are available in fun colors including blueberry, grape, watermelon and sour apple. 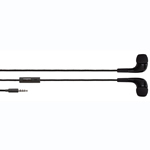 You'll need some practice, however, to keep your chicBud cords tangle-free; you have to pull both the earpiece and minijack cables out of opposite ends of the case at the same time. Griffin TuneBuds Mobile (street: $25, retail: $40) These sleek, sloping black earbuds blend perfectly with both a dark business suit or a little black cocktail dress. You also get a basic black case for unobtrusive storage in a clutch purse or business shoulder bag. But these phones are more than understated style—they mean business with their in-line microphone for use with your iPhone or BlackBerry. You also get three different-sized ear tips. Whether running on a jogging trail, through a park or on city streets, you don't want to be isolated from the sounds of your surroundings, but you need phones that stay where you stick them as you pound the pavement. 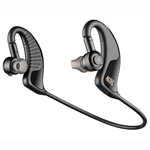 Sennheiser OMX 80 Sport II (street: $55, retail: $60) Designed to withstand your sweat, these water-resistant clip-ons from a well-respected name in portable sound adjust to assure a tight, sure fit so they won't bounce throughout your run. The speakers sit over, not in your ear, so you can hear what's happening around you. The left speaker cord is twice as long as the right to accommodate a music player strapped around your right bicep. Plus, you get a cable clip and a translucent carrying case. The first thing you want is to hear is a driving beat to pace your workout. The last thing you want to hear is the heaving and panting of the person on the neighboring treadmill. 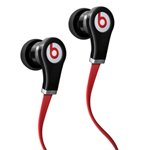 Monster Beats by Dr. Dre Tour (street: $150, retail: $180) Hip hop icon Dr. Dre helped design these equally iconic-styled sound-isolating earphones from Monster Cable, so these buds are all about the bass. Aside from the inclusion of different-sized ear tips, the Beats are built with a one-of-a-kind flat Duraflex cable jacket that is almost impossible to tangle. The Beats are engineered with the iPod sound-leveling Sound Check feature in mind, providing enough power for you to rock to the quietest tracks in the nosiest gym. Earphone cords tangle and twist into knots, they get caught on buttons and broaches and they're just plain unattractive. The answer: Bluetooth stereo. Plantronics BackBeat 903 (street: $54, retail $100) With the BackBeat 903s you get a solid stereo listening experience and crystalline Bluetooth conversations. The behind-the-neck band is loose and rubbery, so the ear modules and earbuds speakers will sit comfortably on any head. Pressing the OpenMic button lets you monitor the outside world, and the bass boost helps put the thump into your tunes. If you don't like wearing in-ear buds, especially on long plane flights, then noise cancelling headphones are a carry-on must. Bose QuietComfort 15 (street/retail: $300) There's simply no comparison between these latest noise-cancelling headphones from Bose and other noise cancelling models. Not only do these surprisingly lightweight full-cup phones eliminate around three-quarters of all engine whine (earlier models eliminated half), they just plain sound terrific, with much less of that annoying elevator-like inner ear sound pressure popping commonly produced by noise cancelling headphones. One AAA battery lasts up to 35 hours. sub $100 earbuds: Shure 215 and HiFiMan RE-400 are great too. Also SONY MDR-EX650 is pretty good. Thanks for sharing this guide filled with some really good headphone. Shared this to twitter thanks guys!